Do you want to cloth diaper your baby but are over whelmed by the number of choices out there?! Our Cloth Diaper Rentals are for you! The Petite Bottoms Prefold Diaper Rental is a great way to try cloth diapering your baby at any stage! It's never to late to give cloth diapers a try! 4 Gently used or new covers, choose Preemie, Newborn or One Size. You may also choose velcro or snap closure. If you would like to try both, choose the "Mixed" option at the time of check out. You will get two covers in each type of closure. If there is a particular brand that you would like to try simply leave a note in the comments section. If it is avaialbe we will include it in your rental. At the time of checkout leave your estimated due date in the comments section, if you are purchasing the rental for your newborn. We will mail your rental to you two weeks prior to baby's estimated arrival. If your baby should arrive early we can ship out your rental immediately. Local customers may choose to pick up their rental at our retail location in Concord, NH or have it delivered to their door step! =$90 store credit or $45 cash back upon the return of the rental package. Minus any damaged or not returned items, and late fees of $5 per day. We recommend purchasing your rental two months prior to your estimated due date to ensure that all of your items are available to ship to you. The $35 start up cost is not refundable even if you choose to cancel your rental. We recommend purchasing your rental two months prior to your estimated due date because we want to ensure that all of your items are available to ship to you. The $50 start up cost and $80 two month rental fee are not refundable even if you choose to cancel your rental or return it early. If there is a detergent that you would like to use that is not on this list please contact us before use to ensure that it is cloth diaper safe. Please do not use fabric softener on your diaper rental diapers. Please use only cloth diaper safe diaper rash creams on your cloth diaper rental diapers, CJ's Butter, GroVia Magic Stick, Thirsties Booty Love, California Natural, Earth Mama Angel Baby, Bottoms Up, Ruby Petuty, Coconut Oil, Eco Sprout rash cream. If there is a diaper rash cream that you would like to use and it's not on this list please contact us before use to ensure that it is cloth diaper safe. Using items that are not listed above prior to double checking with us may result in the forfeit of your return. If you find that a certain cover is not working for your baby please let us know. We can exchange it for one that does! If you need to size up on your prefolds sooner than you expected we are happy to do so for you. You are able to customize your rental to work best for you. You are free to choose a mix of sizes. We have tried to keep the options and explaination simple and clear for those that are new to cloth diapering. 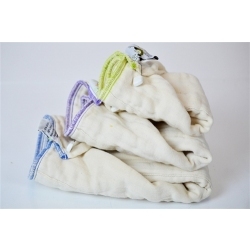 We understand that having a baby can be over whelming and the choices for cloth diapering are many. We are here to help you pick the best rental program for you. If you need any assistance please stop in the store or call us at, 424-256-8448. Rentals may be a mix of gently used and new items. Some gently used may have small or faint stains on them. By purchasing this package online or in our retail store you agree to all of the above terms, conditions, explanations and requirements.